Use the Office 365 Import service and drive shipping to bulk-import PST files to user mailboxes. Drive shipping means that you copy the PST files to a hard disk drive and then physically ship the drive to Microsoft. When Microsoft receives your hard drive, data center personnel will copy the data from the hard drive to a storage area in the Microsoft cloud. Then you have the opportunity to trim the PST data that's actually imported to the target mailboxes by setting filters that control what data gets imported. After you start the import job, the Import service imports the PST data from the storage area to user mailboxes. Using drive shipping to import PST files to user mailboxes is one way to migrate your organization's email to Office 365. You have to perform Step 1 once to down load the secure storage key and the import tool. After you perform these steps, follow Step 2 through Step 6 each time you want to ship a hard drive to Microsoft. 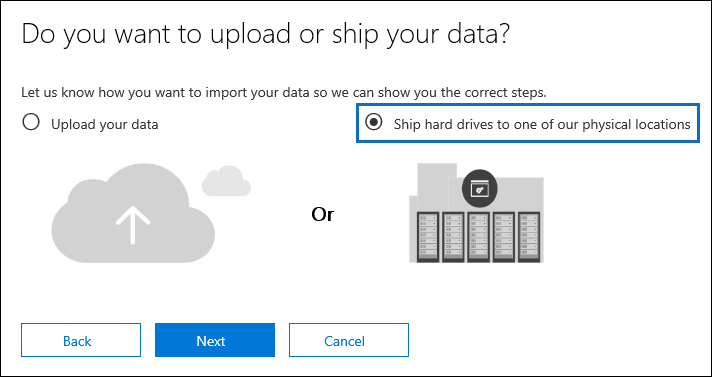 For frequently asked questions about using drive shipping to import PST files to Office 365, see FAQs for using drive shipping to import PST files. You need to store the PST files that you want to copy to a hard drive on a file server or shared folder in your organization. In Step 2, you'll run the Azure Import Export tool (WAImportExport.exe) that will copy the PST files that are stored on this file server or shared folder to the hard drive. The hard drive that you copy the PST files to must be encrypted with BitLocker. The WAImportExport.exe tool that you run in Step 2 will help you set up BitLocker. It also generates a BitLocker encryption key that Microsoft data center personnel will use to access the drive to upload the PST files to the Azure storage area in the Microsoft cloud. Drive shipping is available through a Microsoft Enterprise Agreement (EA). Drive shipping isn't available through a Microsoft Products and Services Agreement (MPSA). The cost to import PST files to Office 365 mailboxes using drive shipping is $2 USD per GB of data. For example, if you ship a hard drive that contains 1,000 GB (1TB) of PST files, the cost is $2,000 USD. You can work with a partner to pay the import fee. For information about finding a partner, see Find your Office 365 partner or reseller. You or your organization must have an account with FedEx or DHL. Organizations in the United States, Brazil, and Europe must have FedEx accounts. Organizations in East Asia, Southeast Asia, Japan, Republic of Korea, and Australia must have DHL accounts. Microsoft will use (and charge) this account to return the hard drive back to you. The hard drive that you ship to Microsoft might have to cross international borders. If this is the case, you're responsible for ensuring that the hard drive and the data it contains are imported and/or exported in accordance with the applicable laws. Before shipping a hard drive, check with your advisors to verify that your drive and data can legally be shipped to the identified Microsoft data center. This will help to ensure that it reaches Microsoft in a timely manner. This procedure involves copying and saving a secure storage key and a BitLocker encryption key. Be sure to take precautions to protect these keys like you would protect passwords or other security-related information. For example, you might save them to a password-protected Microsoft Word document or save them to an encrypted USB drive. See the More information section for an example of these keys. After PST files are imported to an Office 365 mailbox, the retention hold setting for the mailbox is turned on for an indefinite duration. This means that the retention policy assigned to the mailbox won't be processed until you turn off the retention hold or set a date to turn off the hold. Why do we do this? If messages imported to a mailbox are old, they might be permanently deleted (purged) because their retention period has expired based on the retention settings configured for the mailbox. Placing the mailbox on retention hold will give the mailbox owner time to manage these newly-imported messages or give you time to change the retention settings for the mailbox. See the More information section for suggestions about managing the retention hold. You can import PST files to an inactive mailbox in Office 365. You do this by specifying the GUID of the inactive mailbox in the Mailbox parameter in the PST Import mapping file. See Step 3: Create the PST Import mapping file for more information. See Step 3: Create the PST Import mapping file for more information. The first step is to download the secure storage key and the tool and that you will use in Step 2 to copy PST files to the hard drive. You have to use Azure Import/Export tool version 1 (WAimportExportV1) to successfully import PST files by using the drive shipping method. 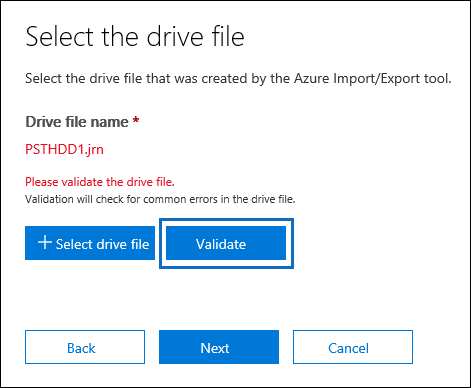 Version 2 of the Azure Import/Export tool isn't supported and using it will result in incorrectly preparing the hard drive for the import job. Be sure to download the Azure Import/Export tool from the Security & Compliance Center by following the procedures in this step. Go to https://protection.office.com/ and sign in using the credentials for an administrator account in your Office 365 organization. As previously stated, you have to be assigned the appropriate permissions to access the Import page in the Security & Compliance Center. In the import job wizard, type a name for the PST import job, and then click Next. Use lowercase letters, numbers, hyphens, and underscores. You can't use uppercase letters or include spaces in the name. On the Choose import job type page, click Ship hard drives to one of our physical locations and then click Next. a. In step 2, click Copy the secure storage key. After the storage key is displayed, click Copy to clipboard and then paste it and save it to a file so you can access it later. b. In step 3, Download the Azure Import/Export tool to download and install the Azure Import/Export (version 1) tool. In the pop-up window, click Save > Save as to save the WaImportExportV1.zip file to a folder on your local computer. Click Cancel to close the wizard. You'll come back to the Import page in the Security & Compliance Center when you create the import job in Step 4. The next step is to use the WAImportExport.exe tool to copy PST files to the hard drive. This tool encrypts the hard drive with BitLocker, copies the PSTs to the hard drive, and creates a journal file that stores information about the copy process. To complete this step, the PST files have to be located in a file share or file server in your organization. This is known as the source directory in the following procedure. After you run the WAImportExport.exe tool the first time for a hard drive, you have to use a different syntax each time after that. This syntax is explained in step 4 of this procedure to copy PST files to the hard drive. If you run the command prompt as an administrator (by selecting "Run as administrator" when you open it) error messages will be displayed in the command prompt window. This can help you troubleshoot problems running the WAImportExport.exe tool. Go to the directory where you installed the WAImportExport.exe tool in Step 1. Run the following command the first time that you use the WAImportExport.exe to copy PST files to a hard drive. The following table describes the parameters and their required values. Specifies the name of the journal file. This file is saved to the same folder where the WAImportExport.exe tool is located. Each hard drive you ship to Microsoft must have one journal file. Every time you run the WAImportTool.exe to copy PST files to a hard drive, information will be appended to the journal file for that drive. Microsoft data center personnel will use the information in the journal file to associate the hard drive with the import job that you create in Step 4, and to upload the PST files to the Azure storage area in the Microsoft cloud. Specifies the drive letter of the hard drive when it's connected to your local computer. Specifies the name of the copy session. A session is defined as each time you run the WAImportExport.exe tool to copy files to the hard drive. The PST files are copied to a folder named with the session name specified by this parameter. Specifies the source directory in your organization that contains the PST files that will be copied during the session. Be sure to surround the value of this parameter with double-quotation marks (" "). 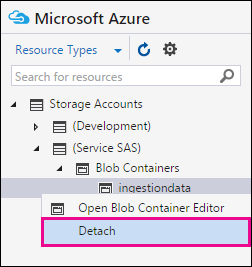 Specifies the destination directory in the Azure storage area in the Microsoft cloud where the PSTs will be uploaded. You must use the value ingestiondata/. Be sure to surround the value of this parameter with double-quotation marks (" "). Optionally, you can also add an additional file path to the value of this parameter. For example, you can use the file path of the source directory on the hard drive (converted to a URL format) , which is specified in the /srcdir: parameter. For example, \\FILESERVER01\PSTs is changed to FILESERVER01/PSTs. In this case, you still must include ingestiondata in the file path. So in this example, the value for the /dstdir: parameter would be "ingestiondata/FILESERVER01/PSTs". One reason to add the additional file path is if you have PSTs files with the same filename. > [!NOTE]> If you include the optional pathname, the namespace for a PST file after it's uploaded to the Azure storage area will include the pathname and the name of the PST file; for example, FILESERVER01/PSTs/annb.pst. If you don't include a pathname, the namespace is only the PST filename; for example annb.pst. /dstdir:"ingestiondata/"
Specifies the storage account key that you obtained in Step 1. Be sure to surround the value of this parameter with double-quotation marks (" "). This switch turns on BitLocker for the hard drive. This parameter is required the first time you run the WAImportExport.exe tool. The BitLocker encryption key is copied to the journal file and the log file that is created if you use the /logfile: parameter. As previously explained, the journal file is saved to the same folder where the WAImportExport.exe tool is located. This optional parameter specifies a folder to save log files to. If not specified, the log files are save to the same folder where the WAImportExport.exe tool is located. Be sure to surround the value of this parameter with double-quotation marks (" "). WAImportExport.exe PrepImport /j:PSTHDD1.jrn /t:f /id:driveship1 /srcdir:"\\FILESERVER01\PSTs" /dstdir:"ingestiondata/" /sk:"yaNIIs9Uy5g25Yoak+LlSHfqVBGOeNwjqtBEBGqRMoidq6/e5k/VPkjOXdDIXJHxHvNoNoFH5NcVUJXHwu9ZxQ==" /encrypt /logdir:"c:\users\admin\desktop\PstImportLogs"
After you run the command, status messages are displayed that show the progress of copying the PST files to the hard drive. A final status message shows the total number of files that were successfully copied. Run this command each subsequent time you run the WAImportExport.ext tool to copy PST files to the same hard drive. Here's an example of the syntax for running subsequent sessions to copy PST files to the same hard drive. WAImportExport.exe PrepImport /j:PSTHDD1.jrn /id:driveship2 /srcdir:"\\FILESERVER01\PSTs\SecondBatch" /dstdir:"ingestiondata/"
After Microsoft data center personnel upload the PST files from the hard drive to the Azure storage area, the Import service will use the information in the PST Import mapping file, which is a comma separated value (CSV) file, that specifies which user mailboxes the PST files will be imported to. You will submit this CSV file in the next step when you create a PST Import job. The first row, or header row, of the CSV file lists the parameters that will be used by the PST Import service to import the PST files to user mailboxes. Each parameter name is separated by a comma. Each row under the header row represents the parameter values for importing a PST file to a specific mailbox. You will need a row for each PST file that was copied to the hard drive. Be sure to replace the placeholder data in the mapping file with your actual data. Don't change anything in the header row, including the SharePoint parameters; they will be ignored during the PST Import process. Specifies the folder location in the Azure storage area that PST files will be copied to when the hard drive is shipped to Microsoft. What you add in this column in the CSV file depends on what you specified in for the /dstdir: parameter in the previous step. If you have subfolders on the source location, then the value in the FilePath parameter must contain the relative path for the subfolder; for example, /folder1/user1/. If you used /dstdir:"ingestiondata/", then leave this parameter blank in the CSV file. If you included an optional pathname for the value of the /dstdir: parameter (for example, /dstdir:"ingestiondata/FILESERVER01/PSTs", then use that pathname (not including "ingestiondata") for this parameter in the CSV file. The value for this parameter is case sensitive. Either way, don't include "ingestiondata" in the value for the FilePath parameter. Leave this parameter blank or specify only the optional pathname. FALSE Imports the PST file to the user's primary mailbox. TRUE Imports the PST file to the user's archive mailbox. This assumes that the user's archive mailbox is enabled. If you set this parameter to TRUE and the user's archive mailbox isn't enabled, the import for that user will fail. Note that if an import fails for one user (because their archive isn't enabled and this property is set to TRUE), the other users in the import job won't be affected. The next step is to create the PST Import job in the Import service in Office 365. As previously explained, you will submit the PST Import mapping file that you created in Step 3. 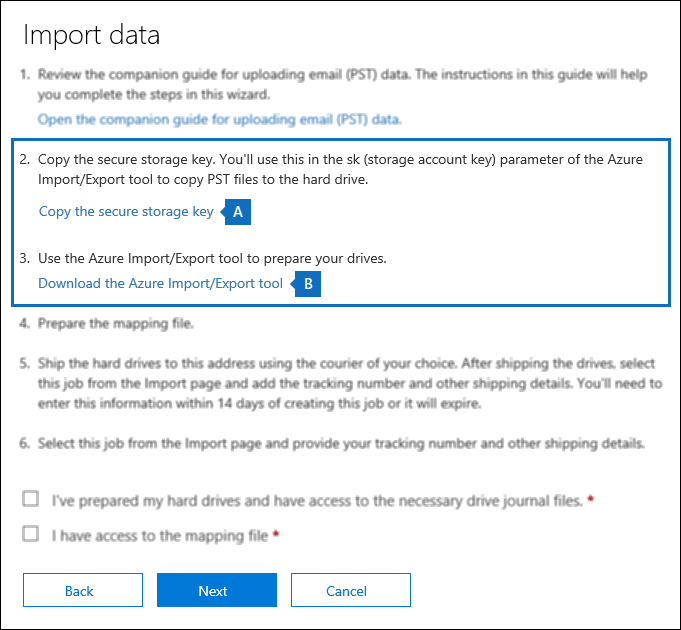 After you create the new job, the Import service will use the information in the mapping file to import the PST files to the specified user mailbox after the PST files are copied from the hard drive to the Azure storage area and you create and start the import job. In step 6, click the I've prepared my hard drives and have access to the necessary drive journal files and I have access to the mapping file check boxes, and then click Next. On the Select the drive file page, click Select drive file, and then go to the same folder where the WAImportExport.exe tool is located. The journal file that was created in Step 2 was copied to this folder. Select the journal file; for example, PSTHDD1.jrn. When you ran the WAImportExport.exe tool in Step 2, the name of the journal file was specified by the /j: parameter. After the name of the drive file appears under Drive file name, click Validate to check your drive file for errors. The drive file has to be successfully validated to create a PST Import job. Note the file name is changed to green after it's successfully validated. If the validation fails, click the View log link. A validation error report is opened, with a error message with information about why the file failed. You must add and validate a journal file for each hard drive you ship to Microsoft. After adding and validating a journal file for each hard drive that you'll ship to Microsoft, click Next. Click Select mapping file to submit the PST Import mapping file that you created in Step 3. After the PST mapping file is successfully validated, click Next. On the Provide contact information page, type your contact information in the applicable boxes. Note that the address for the Microsoft location that you will ship your hard drives to is displayed. This address is auto-generated based on your Office 365 data center location. Copy this address to a file or take a screenshot. Read the terms and conditions document, click the checkbox, and then click Save to submit the import job. When the import job is successfully created, a status page is displayed that explains the next steps of the drive shipping process. On the Import page, click Refresh to displayed the new drive shipping import job in the list of import jobs. Note that the status is set to Waiting for tracking number. You can also click the import job to display the status flyout page, which contains more detailed information about the import job. The next step is to ship the hard drive to Microsoft, and then provide the tracking number for the shipment and return shipment information for the drive shipping job. After the drive is received by Microsoft, it will take between 7 and 10 business days for data center personnel to upload your PST files to the Azure storage area for your organization. If you don't provide the tracking number and return shipment information within 14 days of creating the import job, the import job will be expired. 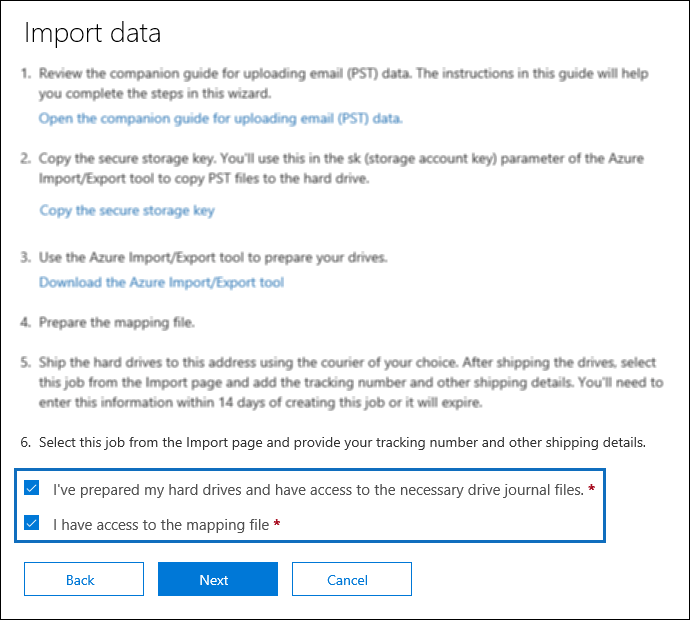 If this happens, you'll have to create a new drive shipping import job (see Step 4: Create a PST Import job in Office 365) and re-submit the drive file and the PST import mapping file. Don't ship the SATA-to-USB adapter; you only have to ship the hard drive. Package the hard drive properly; for example, use an anti-static bag or bubble wrap. Use a delivery carrier of your choice to ship the hard drive to Microsoft. Ship the hard drive to the address for the Microsoft location that was displayed when you created the import job in Step 4. Be sure to include "Office 365 Import Service" in the ship-to address. After you ship the hard drive, be sure to write down the name of the delivery carrier and the tracking number. You'll provide these in the next step. After you've shipped the hard drive to Microsoft, complete the following procedure on the Import service page. In the left pane, click Data governance and then click Import. On the Import page, click the job for the drive shipment that you want to enter the tracking number for. On the status flyout page, click Enter tracking number. Delivery carrier Type the name of the delivery carrier that you used to ship the hard drive to Microsoft. Tracking number Type the tracking number for the hard drive shipment. Return carrier account number Type your organization's account number for the carrier that listed under Return carrier. Microsoft will use (and charge) this account to ship your hard drive back to you. Note that organizations in the USA and Europe, must have an account with FedEx. Organizations in Asia and the rest of the world, must have an account with DHL. Click Save to save this information for the import job. On the Import page, click Refresh to update the information for your drive shipping import job. Notice that status is now set to Drives in transit. After your hard drive is received by Microsoft, the status for the import job on the Import page will change to Drives received. Data center personnel will use the information in the journal file to upload your PST files to the Azure storage area for your organization. At this point, the status will change to Import in-progress. As previously stated, it will take between 7 to 10 business days after receiving your hard drive to upload the PST files. After PST files are uploaded to Azure, the status is changed to Analysis in progress. This indicates that Office 365 is analyzing the data in the PST files (in a safe and secure manner) to identify the age of the items and the different message types included in the PST files. When the analysis is completed and the data is ready to import, the status for the import job is changed to Analysis completed. 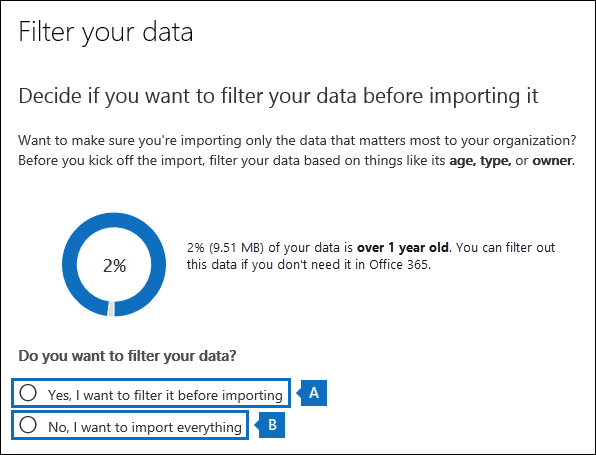 At this point, you have the option to import all the data contained in the PST files or you can trim the data that's imported by setting filters that control what data gets imported. In the left pane, click Data governance > Import. On the Import page, click Ready to import to Office 365 for the import job that you created in Step 4. Click Import to Office 365. The status of the import job is displayed on the Import page. Click Refresh to update the status information that's displayed in the Status column. Click the import job to display the status flyout page, which displays status information about each PST file being imported. When the import is complete and PST files have been imported to user mailboxes, the status will be changed to Completed. 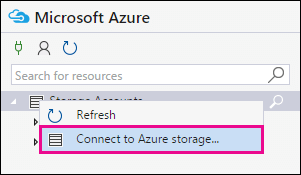 You can install and use the Microsoft Azure Storage Explorer (which is a free, open source tool) to view the list of the PST files that we're uploaded (by Microsoft data center personnel) to the Azure storage area for your organization. You can do this to verify that PST files from the hard drives that you sent to Microsoft were successfully uploaded to the Azure storage area. Important: You can't use the Azure Storage Explorer to upload or modify PST files. The only supported method for importing PST files to Office 365 is to use AzCopy. Also, you can't delete PST files that you've uploaded to the Azure blob. If you try to delete a PST file, you'll receive an error about not having the required permissions. Note that all PST files are automatically deleted from your Azure storage area. If there are no import jobs in progress, then all PST files in the ** ingestiondata ** container are deleted 30 days after the most recent import job was created. Perform the following steps to get the Shared Access Signature (SAS) URL for your organization. This URL is a combination of the network URL for the Azure storage location in the Microsoft cloud for your organization and an SAS key. This key provides you with the necessary permissions to access your organization's Azure storage location. On the Choose import job type page, click Upload your data and then click Next. In step 2, click Show network upload SAS URL. After the URL is displayed, copy it and save it to a file. Be sure to copy the entire URL. Be sure to take precautions to protect the SAS URL. This can be used by anyone to access the Azure storage area for your organization. Click Cancel to close the import job wizard. Click Use a SAS URI, paste the SAS URL that you obtained in step 1 in to in the box under URI, and then click Next. The ingestiondata container is opened; it contains the PST files from your hard drive. The ingestiondata container is located under Storage Accounts > (SAS-Attached Services) > Blob Containers. What happens if the import job fails because of errors in the PST Import CSV mapping file? 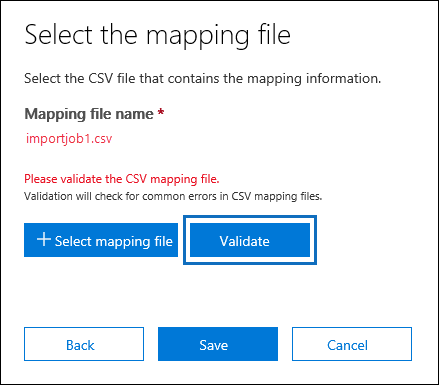 If an import job fails because of errors in the mapping file, you don't have to re-ship the hard drive to Microsoft in order to create a new import job. 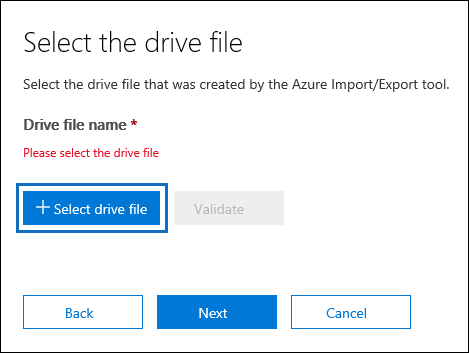 That's because the PST files from the hard drive that you submitted for the drive shipping import job have already been uploaded to the Azure storage area for your organization. In this case, you just have to fix the errors in the PST Import CSV mapping file, and then create a new "network upload" import job and submit the revised CSV mapping file. To create and start a new network upload import job, see Step 5: Create a PST Import job in Office 365 and Step 6: Filter data and start the PST Import job in the topic "Use network upload to import PST files to Office 365." 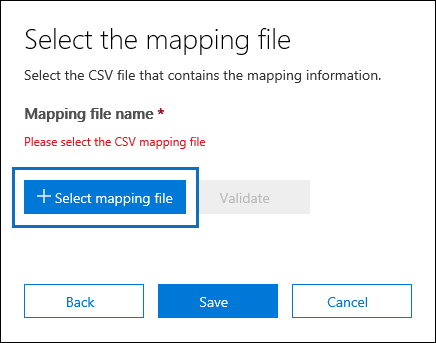 To help you troubleshoot the PST Import CSV mapping file, use the Azure Storage Explorer tool to view the folder structure in the ingestiondata container for the PST files from your hard drive that were uploaded to the Azure storage area. Mapping file errors are typically caused by an incorrect value in the FilePath parameter. This parameter specifies the location of a PST file in the Azure storage area. See the description of the FilePath parameter in table in Step 3. As previously explained, the location of PST files in the Azure storage area was specified by the /dstdir: parameter when you ran the WAImportExport.exe tool in Step 2. Enable archive mailboxes and auto-expanding archiving to give users additional mailbox storage space for the data. Place mailboxes on Litigation Hold to retain the data. Use Microsoft eDiscovery tools to search the data. Apply Office 365 retention policies to control how long the data is retained, and what action to take after the retention period expires. Search the Office 365 audit log for events related to this data. Import data to inactive mailboxes to archive data for compliance purposes. Protect your organization against data loss of sensitive information. Here's an example of the secure storage account key and a BitLocker encryption key. This example also contains the syntax for the WAImportExport.exe command that you run to copy PST files to a hard drive. Be sure to take precautions to protect these just like you would protect passwords or other security-related information. WAImportExport.exe PrepImport /j:PSTHDD1.jrn /t:f /id:driveship1 /srcdir:"\\FILESERVER1\PSTs" /dstdir:"ingestiondata/" /sk:"yaNIIs9Uy5g25Yoak+LlSHfqVBGOeNwjqtBEBGqRMoidq6/e5k/VPkjOXdDIXJHxHvNoNoFH5NcVUJXHwu9ZxQ==" /encrypt /logdir:"c:\users\admin\desktop\PstImportLogs"
WAImportExport.exe PrepImport /j:PSTHDD1.jrn /id:driveship2 /srcdir:"\\FILESERVER1\PSTs\SecondBatch" /dstdir:"ingestiondata/"
You can configure the retention hold so that it's turned off on some date in the future. You do this by running the Set-Mailbox -EndDateForRetentionHold <date> command. For example, assuming that today's date is June 1, 2016 and you want the retention hold turned off in 30 days, you would run the following command: Set-Mailbox -EndDateForRetentionHold 7/1/2016. In this scenario, you would leave the RentionHoldEnabled property set to True. For more information, see Set-Mailbox.